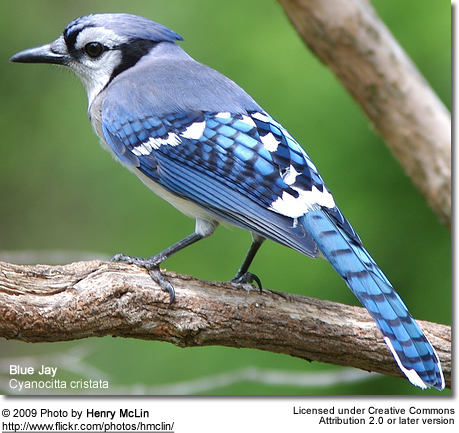 Blue Jays (Cyanocitta cristata) are beautiful crested, blue-plumaged, large songbirds that have an expansive distribution across North America. 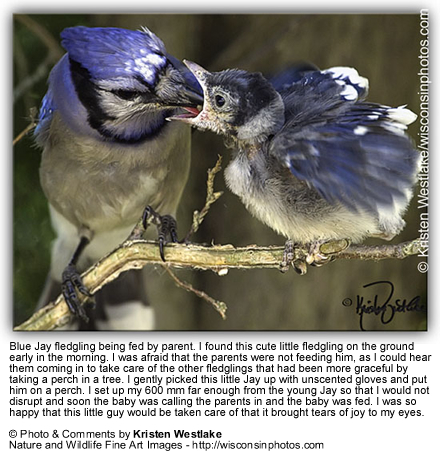 These jays are generally unafraid of humans, and the availability of garden feeders and their willingness to exploit resources offered by humans have enabled these birds to expand their territories in the west. Even though these birds are well appreciated for their colorful plumage details and confiding dispositions, they are amongst the noisiest of all birds, and are known for their aggressiveness towards smaller birds visiting bird feeders. 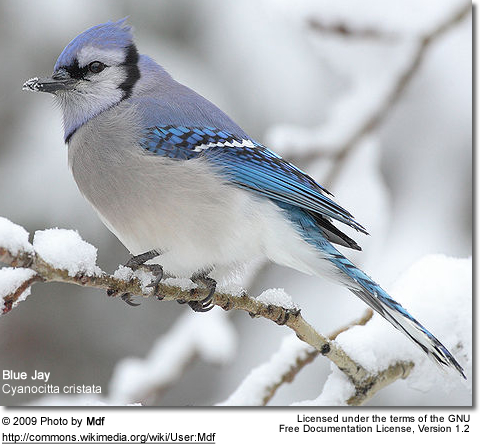 Blue Jays occur naturally in southern Canada (Newfoundland) and in the United States east of the Rocky Mountains. West of the Rockies, they are replaced by the closely related, darker-plumaged Steller's Jays. Northern populations may migrate south for the winter. Those found further south tend to be sedentary (non-migratory). 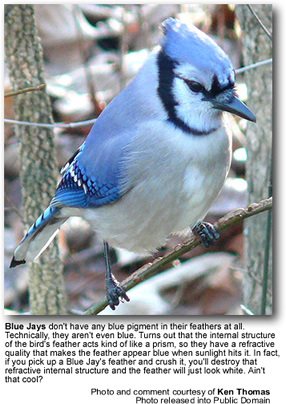 The proportion of migratory Blue Jays is believed to be less than 20 percent. Those birds that do migrate tend to do so in large flocks that often include thousands of them. Their migratory paths extend along the Great Lakes and the East Coast of North America. Migration takes place during the daytime. They are quite common in mixed woodlands (especially those with oaks and beeches), and residential areas. ID: Mid-sized jay. Vivid blue markings. Range: Southern Canada (Alberta to Quebec) to northern USA. ID: Mid-sized jay. Dark blue markings on the upper back and white below. Scrub-Jay: No crest. Solid blue wings and tail (no white barring). Plant material (~ 75% of total diet): includes acorns (staple), beechnuts, seeds, wild fruits, berries and grain. At bird feeders, they are fond of sunflower seeds and peanuts. Excess nuts or acorns may be stashed in holes in the ground. Animal Food: insects and their larvae, earthworms, spiders, snails, mice and other small rodents and frogs. They also take small dead or injured animals (insects, mammals or birds). Very rarely, they will destroy and eat the eggs and nestlings of smaller birds. 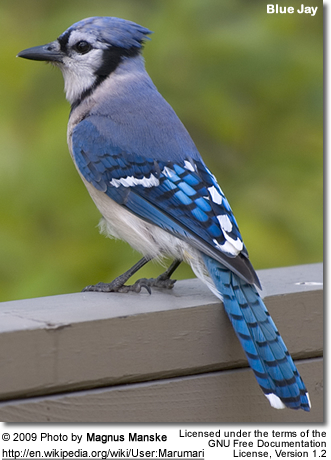 Blue Jays store excess food for later use. Accept food items offered by people, including seeds from bird feeders (sunflower seeds), peanuts, bread, meats, chips, etc. Both the male and female construct the bulky, loose open cup nest out of twigs, sticks, grass, weeds, bark strips and moss. The nest is sometimes strengthened with mud. Male and female both gather materials and build the nest, but on average male does more gathering and female more building. Incubation period / duties: 16 - 18 days; mostly by female, but male may share in the incubation. Male provides food to the brooding female. Hatchlings are naked and blind, with red mouth lining. 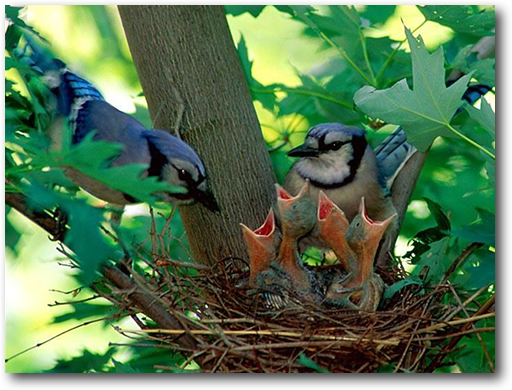 Feeding and protection of the chicks / nestlings: Both parents feed the chicks insects and other protein-rich food items. Both the male and female protect the young, chasing away intruders and may mimic the calls of hawks or other birds of prey to scare off predators. Varying calls include the distinctive "jay- jay" (for which they were named), as well as rattling sounds, growls, whistles and chatters.